Joshua Cooley is the children’s minister at Chapel Hill Bible Church in North Carolina, as well as an author and a freelance writer. His latest book is The One Year Devotions with Jesus. He blogs at joshuacooleyauthor.com. The most famous mouthpiece in the NBA — maybe in league history — went flying in frustration. It inadvertently hit a fan near the scorer’s table. A referee assessed a technical foul and pointed his finger toward the locker room, inciting roaring jeers from the crowd of 20,562. With that, Stephen Curry’s night was over and, with it, so were the Golden State Warriors’ already slim chances to claw back into a nightmarish Game 6 of the NBA Finals in Cleveland on Friday night. The Cavaliers went on to win, 115–101, and tie the series at 3–3 after looking virtually done only six days earlier. In a season of soaring achievements, this might have been the lowest point for Curry and the Warriors. At least that’s what they’re hoping as the series heads back to Oakland, for a momentous Game 7 on Sunday night. No team has ever lost a 3–1 NBA Finals lead as the Warriors are in danger of doing. Golden State’s dream season — and its chance to build a true dynasty with consecutive championships — comes down to one final game. 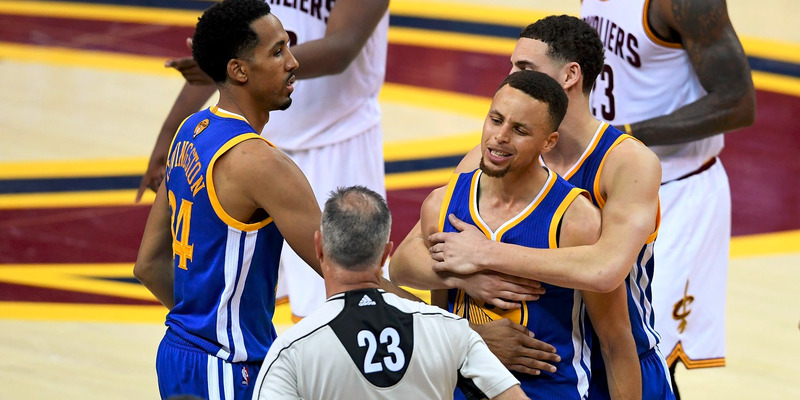 Curry, the most electrifying player in basketball today, has never been ejected from a game before. He is both an unashamed Christian and an extreme competitor. And like any Christian, he’s shown that he’s not perfect. In a moment of anger, he made a very public mistake and paid for it. To his credit, he immediately apologized to the fan he hit with his mouthpiece. As Christians, we want to expect better from him. We don’t make excuses for his mistakes. And we are not surprised to discover chinks in the armor of any fellow sinner. We can acknowledge the enormous pressure he’s facing — highest level of basketball in the world, first unanimous NBA Most Valuable Player, first team to win 73 games, potentially first team to lose a 3–1 lead in the Finals — and extend the grace we would hope to receive under similar circumstances. I profiled Curry for FCA Magazine’s May/June edition. He seems to have a good, biblically based perspective on life and his career — and the wild swings of success and failure that come with it. For every huge shot or Game 7 win, there are gut-punch losses (and occasional self-induced trials) to swallow. NBA scoreboards, he says, don’t ultimately define him. He knows there’s a bigger picture involved. By rooting himself in Scripture and acknowledging God’s larger plan, he’s been preparing for these kinds of moments — both glorious highs and frustrating lows — his whole life. These things will surely be on his mind as Sunday night approaches. In the fall of 2006 — long before Curry became a household name, won consecutive MVP awards, or revolutionized the league — he needed a pep talk from his mom. At the time, Curry was a college freshman at Davidson, a nondescript outpost on the NCAA Division I frontier. After starring at Charlotte Christian School, he had hoped to follow in the footsteps of his father, Dell, a 16-year NBA veteran, and play at Virginia Tech, or even at one of the Atlantic Coast Conference’s bluebloods. 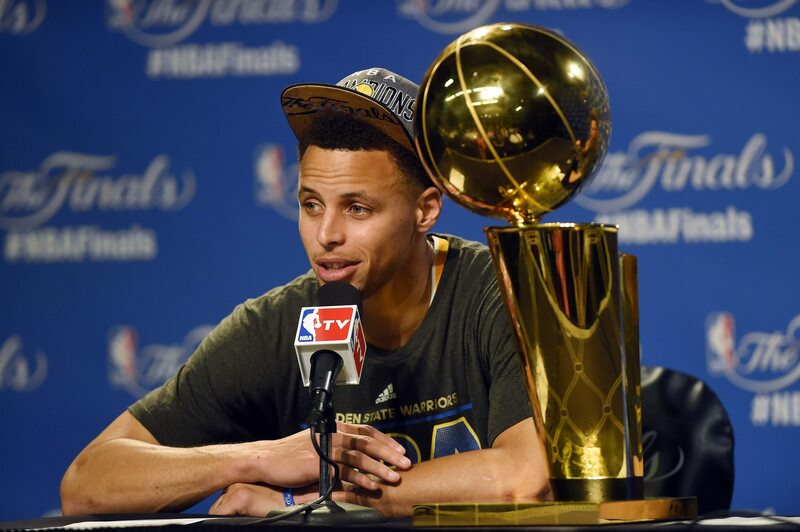 Instead, major college programs looked at Curry’s diminutive stature — about 6 feet and 160 pounds then — and demurred. Only longtime Wildcats coach Bob McKillop believed. So the future basketball supernova who would one day torch NBA record books hopped on Interstate 77 and traveled 30 miles north to Davidson, a small liberal arts school that hadn’t won an NCAA tournament game since 1969. Curry, it seems, can do anything on a basketball court. Using both traditional statistics and advanced metrics, you can make a strong case that he is currently the greatest basketball player in the world. During his 2014–15 MVP season, he averaged 23.8 points per game, broke his own NBA record for three-pointers made in a season (286), and led the Warriors to their first NBA championship in 40 years. But that was only a prologue. This season, the player they call “the Baby-Faced Assassin” became a cheat-code video-game version of himself as he took sports fans on a surreal trip into Basketball Fantasy Land. In earning his second straight MVP award, Curry inflated his scoring average to 30.1 points, destroyed his three-point record (402), and led Golden State to a regular-season record of 73–9, eclipsing the former standard (72–10) of Michael Jordan’s 1995–96 Chicago Bulls. His deadly accuracy, ever-increasing range, and flair for last-minute heroics has flummoxed defenses and helped usher in a new chapter within the league: The Up-Tempo Era of the Guard, starring Steph Curry, is now playing in arenas nationwide. Curry’s ascent from overlooked high schooler to the NBA’s top player has transformed him into a worldwide megastar with massive Madison Avenue appeal. When he tosses a mouthpiece, the world takes notice. Earlier this year, Forbes Magazine named him the featured athlete in its fifth annual “30 under 30 list” of young entrepreneurs and game changers. His jersey sales were tops in the NBA for the second straight year, and he gets mobbed for autographs wherever he goes. Even his pre-game warm-up routine has become a must-see event for opposing fans on the road. He’s become perhaps the most famous Christian mouthpiece. On a personal level, life is good, too. He is married to a loving wife, Ayesha, and the couple has two adorable daughters. He also enjoys great support from a strong family, including Christian parents and two younger siblings. I can do all things, indeed. But does that kind of worldly success reflect the true meaning of Philippians 4:13? Hardly. In recent years, this verse — with a message that sounds tailor-made for locker room placards — has become somewhat of a hackneyed, misinterpreted inspirational mantra for faith-minded athletes, both amateur and pro, who believe it blindly promises great success in their endeavors. Yet the original context of Philippians 4:13 couldn’t be more disparate from twenty-first-century American sports culture. When Paul penned these divinely inspired words, he was locked in a Roman prison in the early 60s A.D. The immediate literary setting of this passage was Paul’s contentment “in whatever situation” he faced (Philippians 4:11), including incarceration in a pagan society outwardly hostile to Christianity. Paul could remain content in all circumstances because of “him who strengthens me.” The source of his joy was a faithful, steadfast Savior rather than present surroundings. He knows that the “all things” of Philippians 4:13 that he can do through Christ transcend the basketball court. He knows the “good” of Romans 8:28 that God sovereignly orchestrates in his life doesn’t refer to ephemeral fame, success, or wealth. He understands the “purpose” he’s been called to is so much loftier than NBA records or championships. The same biblical author who wrote, “I can do all things through him who strengthens me” while bearing Roman fetters also wrote, “Whether you eat or drink, or whatever you do, do all to the glory of God” (1 Corinthians 10:31). God’s glory, according to Paul, is the end goal, the final scoreboard tally. Curry gets this, too. With a ball in his hands, he can do remarkable things, but ultimately, he’s striving to do them for his Creator — no matter what happens in Game 7. “I’ve always been a believer that the Lord has put whatever talent in you, [and] whatever gift he has put in you, he wants you to get the most out of that, he wants you to be successful, he wants you to pursue and work and be passionate about it,” Curry says. Joshua Cooley (@JoshuaCooley9) is the children’s minister at Chapel Hill Bible Church in North Carolina, as well as an author and a freelance writer. His latest book is The One Year Devotions with Jesus. He blogs at joshuacooleyauthor.com.